I agree with you wolfgrimdark but it seems it sometimes takes me a couple of arrow shots to get my companion to start attacking. This can be a hindrance because by the time they kick in its too late for them to use their ranged option and some of them have much better ranged weapons which you want them to use. I had the same idea about the AI as @wolfgrimdark, but I also agree with ^. It would be very nice if they fix the defensive AI so they auto-attack when the player is under threat at least. There were a couple times where an enemy is charging me and Duras is just standing there. But other times he jumps on it sooner. Weird bug I guess. Duras loves to shoot his arrows into the ground while talking trash to the enemy. It's pretty funny sometimes but gets annoying after awhile. They definitely need to tweak the AI for the companion's ranged attacks. That happens to me only when we are higher than the enemy, and the enemy is underneath us obscured by a rock or something. The AI thinks it's a straight line of sight rather than taking into account the obstacle in the way. Yeah Fluent, I've noticed the same. The enemy AI will do the same, such as fire rockets straight into the ground and blow themselves up if you stand below them. It's a general AI thing, not specific to companions. Good to know. I'm hoping the patch they're working on tones that up a bit. This seems to happen after conversation - e.g. met some exiles in the Valley of whatever and they threatened me, then they attacked without provocation …all 5 of them, he just walked around watching as they murdered me. Not cool, Duras. I died and then decided that was too hard and loaded and went elsewhere. I'm using melee weapons only. Another issue: save games slots seem to be limited to 100. At that point I get an endless 'saving' logo…and you can't select save game anymore. Deleting saves manually from your save folder location sorts this out. I don't need a 100 saves, but I tend to be paranoid so save a lot in different slots. I don't think this affects autosave or quicksave slots though. @booboo, get a melee weapon with side effect (fire, poison, electricity, etc) - these weapons melt minibosses like crazy so companion bugged AI won't feel a huge problem. Yes you need to up str/dex stats, but then all you need is Elex and Strong Elex pots which is not so hard whether you'll steal everything or play nonthief by upping animal trophies skill and sell those. mental energy reserves doesn't require additional mats to improve it and for some reason the cleric requirement is ignored, any character can craft it. Speaking of theft, you don't need to steal these sideeffect imbued weapons if you don't want to, one of such you'll find near winged miniboss (gathering healing plants quest you get early in berserkers settlement). This of course doesn't redeem problematic AI which definetly needs to be fixed. While I got used to it, it behaves as stupid RNG roguelikes where you don't know if it'll trigger or not - and I don't think this game is supposed to be Neo Scavenger 2 rubbish. I found something I am not sure if it is a bug or design. It is a small side quest relating to getting 6 machine parts for Jora. But since I have to talk about the issue will put it in spoilers. Just note its details on the quest mechanics and dialogue and doesn't really spoil much of anything. I went and talked to this Beserker who thinks he is cursed. He was sent there to get the parts as well by Jora. I told him I would get my own parts. I then died a couple of times so decided to come back later when I was stronger. Which I did. I could only get 3 parts as it appears you have to either A) give your parts to this guy so he can bring them all back to Jora or B) take them from the guy by force or possibly persuasion. Here is the issue - I didn't have the skill when I first met him to convince him to give me his parts. I did not know at the time I could only find 3 parts at the ruins. I found this out much later. So when I first met him I said no to giving him any parts I found - as why should I? So 2 levels later I discover you can only get 3. But I don't have any option to give them to him. I can only say "Give me the parts" and if I do that he turns hostile. If I kill him I get a message warning me that this has changed a core story detail. But I don't want to kill him anyhow. Part of the problem with the Beserkers is they don't have enough people to fight as it is. So I try to avoid killing any of them. Plus I don't really like killing if I can help it. In the end it means I will never be able to finish this quest unless I kill him for the parts. I have 3 parts stuck in my inventory. I can't offer them to him. I can't talk to Jora about it (no option to discuss it with him). I even did the other quest for this guy and got his club back and did the "scratch my back you scratch mine" thinking he would give me the parts … nope he just gave me some shards. So to me its a bug as they should keep the option for you to give him the parts. But maybe they don't see that as a bug - once you say no there is no going back which I guess is a PB feature. So either I live with my OCD about this or I have to reload back to a save where I first met him and select I will give him the parts … and loose about 10 hours of game play. Not a big deal since its my own mental issue but I admit slightly annoying. Most likely I will reload as I hate having this unfinished after putting so much work into it. I still didn't go for that quest as there are hundreds of them in my logbook so dunno. If you don't want to kill the guy, quest items can usually be pickpocketed so you may try that if you want to spare the poor sod. So far in my game the only quest item I couldn't pickpocket was Alrik's keyring which I had to receive through dialogue. But there are definetly kill/nokill bugs out there. When you reach Domed City, you'll meet a bounty hunter (forgot the name, starts with B). You may pay him to give you his contract to kill Ray, or you may kill him then loot it. If you don't kill him but "buy" the contract, Ray will still talk to you as if the guy is now dead. I just finished that quest last night, WGD. I'm level 7, so it was a tough fight with the monster standing over his weapon. I was able to give him the parts, since I basically save before every conversation and play it out to the best result…. I have several weapons I can't use but armor is really scarce outside. I think it's hokey that enemies never drop armor. If I headshot a guy, wouldn't the rest of his armor be fine? Same with body blows, should the gloves and head be fine if I aim at the torso, etc. There are several quests that break if you do them out of order. Doing the quest for Eldur will break if you talk to the boss man at the wrong time. Korin will die every time if you follow him back to Goliet instead of fast traveling, etc. Korin walks by the troll at small camp and gets killed in one hit after he purposely attacks it. Idiot! This game is buggier than Skyrim (@joxer bait). I must be playing backwards. I picked up Falk first, then Duras, and Ray will be my third most likely. I was a little surprised that you can only use one companion at a time. Since everyone outside is in groups of four or five, I expected to be able to have two or three companions at one time. Makes the camp basically useless, especially as it doesn't have a workbench or anything else going for it. LOL. No, it's not buggier than Skyrim. What exact Eldur quest breaks? You may think some later quests are also bugged, but they're not really, if you push the main (settlement) questlines too far while ignoring sidequests, these sidequests will resolve themselves (for better or for worse) and you won't be able to complete them on your own. This is by design. Choices/consequences without warning quests will expire if you fastrun the main ones. This doesn't mean there is no questbug. I've posted in tips/tricks thread that Bullet/William quest is bugged so don't touch it until you get OP equipment to save Bullet. I don't know who Korin is, but thanks for the warning. The small camp your sidekicks are currently using is temporary. You'll have a proper "camp" later where you can add a workbench, furniture and hire a trader. Getting companions is not a linear thing and it doesn't matter when you hire them, keep in mind you won't get a certain female companion in Fort that easily - to get her you need to kill some overpowered boss which is impossible early. Haven't got that far yet but there seem to be a lot of dialogue with options where skills are required to make the best options. As I don't have any skills yet, I am trying to not go into those options yet but I feel I may be missing out on some quests…. Don't do it! That's a waste of liquor. @porcozaur - That's not a bug. Some items have more than one recipe. 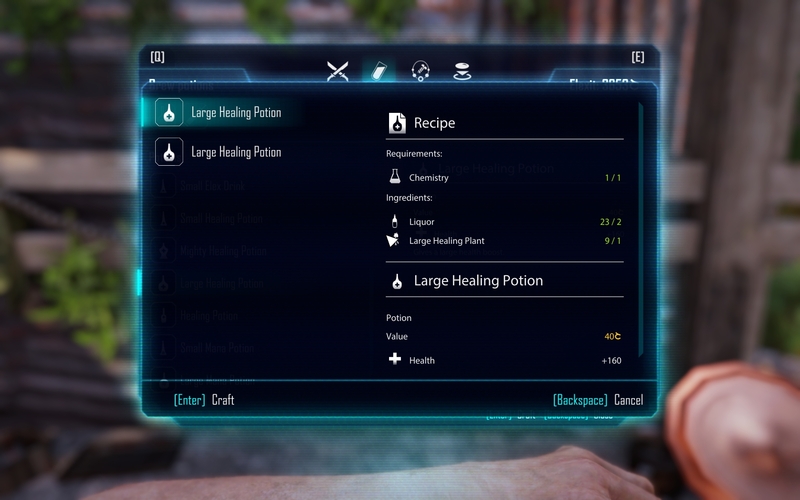 On that note, are you supposed to begin with recipes for nearly every type of healing potion and Elex drink? It seems odd that you only have to earn the alternative recipes. I can make a strong elex drink which gives you an extra learning point, even though I never acquired the recipe. Good question. I noticed I had the recipe for the strong Elex drink and I couldn't remember finding it. I'm not sure what the deal is there. Really? I'm surprised no one mentioned that until now. I'll have to try that later.